Football (or soccer as it is known in some countries) is easily the most popular sport in the world. Soccer leagues like the English Premier League, Spanish La Liga and U.S. Major League Soccer (MLS) have huge fan bases. Unsurprisingly, betting on football is also big business. iPhone and Android sports bettors can now download apps that will allow them to both gamble and watch their favourite team play on their smartphones. In our guide, you will also find a list of football apps that offer betting advice and tips to improve your chances of beating the bookie. Social betting on football games is also growing in popularity thanks to an influx of new apps that allow you to wager against your friends and share your bets. OLBG is probably the biggest online community when it comes to football. You can find thousands of tipsters there and some of them are really profitable. They managed to transfer this huge database to their mobile app and provide a good basis for successful betting. Probably the biggest advantage of using this software is the opportunity to directly follow the advice of profitable users. 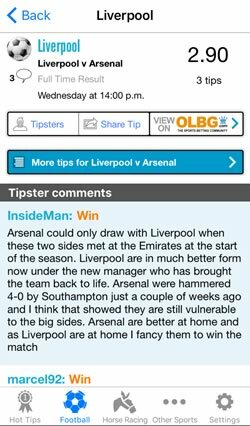 Just browse among the many football tipsters and discover the ones who are proven winners. They are many of those around, so with some research, you should be able to find them. The OLBG app could also save you lots of time. They are a number of well-written reviews with stats and analysis there. This way you won’t need to research everything yourself. In addition to that, you will see many insightful and interesting opinions on various matches. This way you won’t miss any angle and will be able to make the best choices for your football bets. OLBG's betting experts offer tips on every major league and tournaments, including the EPL, Bundesliga, La Liga, the European Championship and World Cup. The OLBG application is available for both iOS and Android. In order to install it, just go to the dedicated App Store and search for OLBG. FootballCoupon.Co.Uk is a very useful tool for mobile betting and provides a number of helpful features. 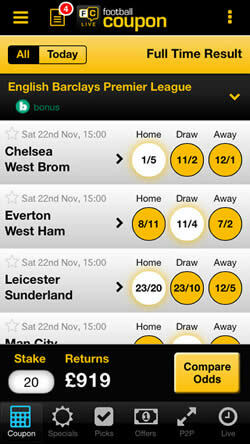 The app compares the odds from lots of bookmakers and shows you the highest in real time. It applies to both single bets and accumulators. The markets supported include Full Time result, Over/Under 2.5 goals, Both teams to score (BTTS), BTTS + result, and Super 6. It automatically finds the best odds for the event you want to make a bet on, which saves lots of time. With this app, you won’t need to go through different bookies in search of the most profitable option. Another valuable feature of FootballCoupon.co.uk is that they display lots of Opta stats and match details. This includes the form of the teams, previous results, analysis, and key points for each game. The information is well-written and will help you to bet smarter. Last, but not least, there is a live scores service which displays everything you need to know about the football match you’re following. Besides the score, it shows stuff like substitutions and cards by the minute. This way you are always aware how your bets are unfolding. The easiest way to install the mobile app is to go directly to the FootballCoupon.co.uk site through your browser. They support Android and iPhone sports betting, so just click Install and follow the steps. The English Premier League is the most popular football competition out there, with the majority of punters following teams such as Manchester United, Liverpool FC, Chelsea and Arsenal. Unfortunately, no bookmaker offers live streaming of the EPL. 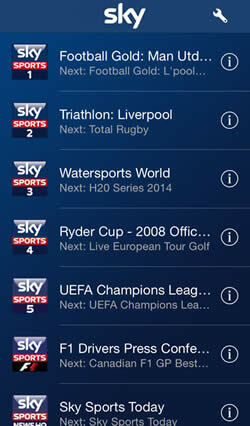 This is why we’ve included Sky Sports Mobile TV in our list. This application allows you to watch live streaming of EPL matches directly on your phone! There are two subscriptions plans. The first one includes the following channels: Sky Sports 1, Sky Sports 2, Sky Sports News HQ. The second one has those three + Sky Sports 3, Sky Sports 4, Sky Sports 5, Sky Sports F1, and Sky News. This way you will be able to watch all EPL games that are broadcasted and also many more sports, shows, and news reports for a small monthly fee. The good thing is that if you are already a Sky Sports customer you won’t have to pay for the subscription. The app is available for iOS and Android in the dedicated App Stores. Good internet connection is required for the live streaming, though. With the development of technology, mobile betting is getting more and more popular. The services and products offered are no longer as limited as they used to be, compared to the websites. Most bookmakers have an almost identical version for mobile devices nowadays, with features like live betting, live streaming of sports, and many others included. Even US sports betting apps now offer many of these features. This is great news for all bettors out there since putting a wager has never been easier. The rest of the industry is catching up and there are a number of tools that can help you make the best choice. Whether it is a stats service, a predictions algorithm, or a good old expert analysis, it’s all available on your phone or tablet now. As European football (soccer) is the most popular sport in the world, it is no surprise to see a huge variety of useful football-related mobile applications. Most bookmakers pay special attention to it while there are various services to help you make the best bet.